International BIG CATS Film Festival - In partnership with the United Nations (and CITES) - Call For Entries & Judges! In partnership with the United Nations (and CITES), we're proud to announce the launch of the International BIG CATS Film Festival. The purpose of this festival is to showcase films that educate their audiences on the importance of our world's amazing feline predators. Due to many threats, several of which are human-caused, big cats are more in danger than ever. We are focusing on eight species: Cheetah, Clouded Leopard, Jaguar, Leopard, Lion, Puma, Snow Leopard and Tiger. We are also encouraging cat experts, film connoisseurs, conservationists and everyone who is qualified in some way to apply to be a festival judge. If you know anyone who is interested, please visit our website for more details (jhfestival.org/big-cats-judging.html). Tell Wildscreen your Symbiotic Stories!! There are amazing tales waiting to be told of animals working together for mutual benefit – if you scratch my back, I’ll scratch yours! Pitch your concept for a short film or photo story, for a chance to win a ticket to Wildscreen Manchester and present your idea to industry experts. Watch: youtube.com/watch?v=RWWW8Sulg5o&feature=youtu.be Kind regards, Gil Arbel. Kenyan Assistant Producer needed for LIVE wildlife broadcasts. WildEarth are looking for a bright and ambitious Kenyan Assistant Producer to join our dynamic team of LIVE wildlife filmmakers. You will be responsible for reviewing and developing our wildlife shows, sourcing footage from our archives, building narratives, helping with administration, creating short form content and you will be trained to direct LIVE shows online and eventually for TV. The job will be based in the Masai Mara National Park. Applicant MUST be a Kenyan National and therefore be qualified to live and work in Kenya. This will be a two month contract but there is a great opportunity within the business to grow and also to travel after this. A passion for wildlife and being in the wild. Organised, self motivated and able to solve problems. Job to commence on as soon as possible. Submit CVs to **email address removed** Salary $1200 per month. NB. This role has been filled. Scubazoo are LOOKING FOR LOCAL TALENT! Scubazoo are looking for presenters, personalities that are passionate about wildlife. If interested, send a 30 second - 1 minute audition video of you to auditions@scubazoo.com. Scubazoo are also looking for young, passionate, motivated individuals to work with their team in Kota Kinabalu as Interns. 7th Green-Go Short Film Contest - Call for Entries Open! You care about nature? You want to be a part of a solution to challenges? You feel creative? Get inspired, find a story, do your research, get your team together, grab your camera and go outside to make your short film now! Send your film by 1 October 2017. Science has proved that we are healthier and happier if we live in greener environment. Parks, gardens, tree lines, orchards, woodlands etc. have many and significant benefits for people, as nature makes us healthier and happier; helps us be fit and beautiful; makes us more creative and improves our memory. Plus, it is good for the economy as well. So what is stopping us from having more nature in our lives? Investigate the root of this problem, point out to its causes or show us a success story and offer a solution. Let your voice be heard! We are taking, we are consuming, and we are wasting without thinking about consequences of our actions. Planet Earth gives us enormous resources. Enormous, but not limitless. Did you know that Earth has to regenerate resources we are using and that we use more than can be reproduced? Every year, the date that marks the day when humanity has exhausted Earth’s natural budget (called the Earth Overshoot Day) arrives earlier and earlier. In 1987 it was on December 19 and last year it was on August 8. Now think, how can we help? We can bike to work or take public transport; we can consume less meat or become vegetarian; we can use less plastic; recycle; lower energy consumption… the choices are multiple. Tell your story about problems and solutions with your short film. Close your eyes and imagine Europe in 33 years from now… Where are you? Are you in a place you are happy to be in or are you somewhere you want to escape from? How the world around you looks like? Think about the problems Europe is facing today: social inequality, loss of animal and plant species, climate change, air pollution, management of water resources, waste, excessive noise and traffic… Will these issues be diminished, increased or will they remain the same? If the extent of problems will change, what is your vision of Europe in 2050? The answer to these challenges is directly related to the next EU budgets and their shape – what will money be spent on? We want to see a green budget, where public money is spent for public good. Send us your vision of Europe in 2050, your dream or your nightmare in a form of short film and let us know what you hope for or what you’re terrified of! 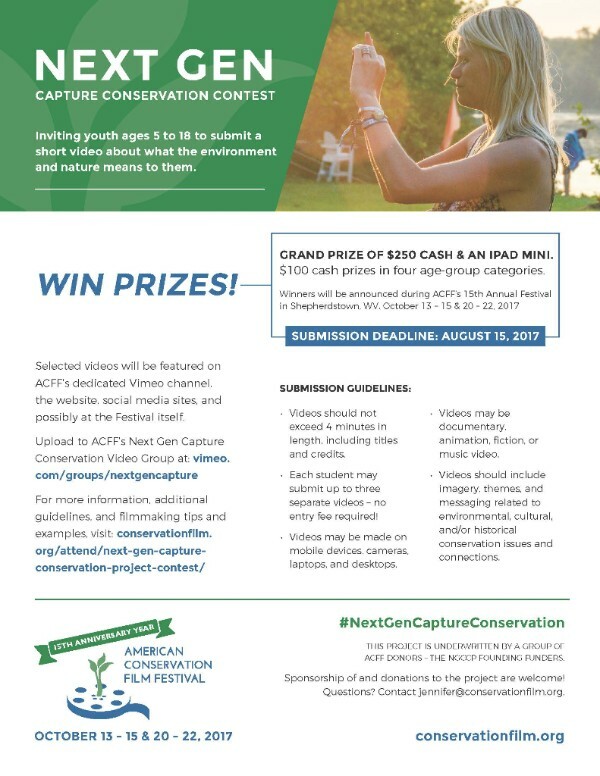 American Conservation Film Festival Short Film Contest for Kids! Cash Prizes!! Sweet summertime is here! And it's a perfect time to get the kids out and exploring their environment with phones, iPads, or cameras in hand! We're excited to launch this new project and contest to engage youth 18 and under in filmmaking, award them for their efforts, and build a Youth Film Archive. SUBMISSION DEADLINE IS AUGUST 15, 2017. Top prize is $250 cash and an iPad mini with $100 prizes in four age categories. CLICK HERE FOR ALL THE DETAILS – Dowload the flyer here! Win a Panasonic Lumix GH5 camera and more! Win a GH5 and More From PremiumBeat! Don’t delay, giveaway ends April 24! Be submitted by 11:59pm Eastern Time Zone on Wednesday, March 1st, 2017. A panel of five judges representing the Center for Environmental Filmmaking and The Nature Conservancy will determine the finalists and grand prize winner. The decision of the judges is final. Awards are based on overall merit of the entries. The organizations listed above reserve the right to post submissions on their websites and social media channels. Submissions that are not received by Wednesday, March 1, 2017, will not be accepted. Finalists will be announced on Wednesday, March 8, 2017. The winner will be announced at American University on Tuesday, March 21, at the DC Environmental Film Festival at 7:00 p.m., in the Forman Theater located in the McKinley Building on the American University campus.